[Lief Bloomquist] was in need of some geeky nostalgia. 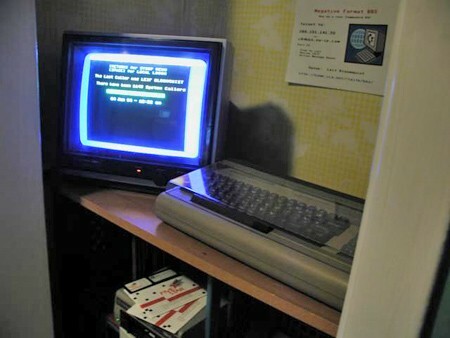 He thought making a BBS server on a Commodore 64 would fill that need perfectly. He used a PC running some routing software to make the BBS server available over the net, without any long distance charges. Anyone with an Internet connection can telnet to the BBS and join the fun. [Jason Scott] made BBS: the Documentary. He has interviewed [Lief] and taken some pictures of the set up. You can view them, as well as download a PowerPoint about the project here. ← Hackit: Modern arcade cabinets? This is very cool but I have seen this before. What I wonder is if it might be possible to hack VICE or MESS to directly support telnet in place of the modem? That way you could just run it on any Linux box in emulation. Not as cools as a real C64 but a little more practical. Yeah I got the busy notice as well, then tried to log on to all the other ones. Only one responded, also with a busy notice. Yep, JUST like the old days. Awesome. I was born in 1986 and kind of missed this period of technology. It was going on around me, but by the time I had an interest it was all about the internet. Sometimes I wish I had been born earlier so I could have experienced that. Geez.. I remember the days of BBSing. Wow. /me goes off to reminisce. tiuk: Trust me at 300 baud you weren’t missing anything. @tiuk Im in exactly the same boat. 1986, there year no one wanted. Ahhh, the BBS. Remember how cool it seemed when a BBS had two nodes and you could chat with another person and the sysop at the same time! One guy’s had an honest-to-god dial-up c64 bbs going for a while now. Gee.. 300 baud was great compared, to what we had before, which was nothing. I admit using 300 baud today, wouldn’t be near the fun as cruising around in a Model A would be. However if 300 baud became the only option again, I’d use it for what it can be used for. I dial-up BBSed heavily there towards the end of it’s popularity. Great idea. It brings back a lot of memories for me. I ran a C64 BBS for over 3 years back in the ’80s. I remember waiting for the first 300baud modem to come out for the C64. Then I upgraded to a 1200baud modem when they came out. Then a 2400baud modem. I still have the 2400baud modem. I’m not trying to hack it. I’m just trying to connect. I’ve read this one eons ago. It’s not just Commidoink %] 64s that have those special connections between serial port of said computer and an ethernet port. That BBS documentary DVD came out almost two years ago. Was fascinated by it myself since I’m way old school I guess – I actually ran a BBS from 1987 to about 1996. On Atari machines. Hence the Commidoink reference. I started a site where we talk about old and current BBS, chat servers, other “pre-web” technology, etc.. if anybody wants to check it out. Just put it up recently, so it isn’t too busy yet, but hopefully the word will get out there and it will be a great place where people can see what systems are currently running (BBS, DDial, STS, GTalk, etc), buy/sell/trade “nostalgic” hardware and software, reminisce about old systems and maybe run into a few old friends. Also going to be distributing my linkable chat server software via the site within the next few months if anyone is interested in running a ddial-like chat server and being part of our network! Hi everyone, this is a brilliant forum, ive read so much before actually registering, and think it is time to give something back to the community myself. I don’t think any of us could have expected money to be so tight as it is at the moment, so what can you do to make your money go further? Well I do have one tip for you, don’t pay too much for your website design. The problem has traditionally been that when you gather web design quotes from different companies, the prices range wildly, but so does the quality of their work. It is a bit like taking your car to a main dealer for repairs, you know it is going to cost much more, but you also know that the quality of the work will be good. Now imagine that someone said their brother does the actual repairs for that main dealer, and he also takes on private work. You would get the exact same work, done by the exact same person, using the exact same tools etc, but at a fraction of the cost. Wouldn’t that be cool, you would snap it up in a second, I know I would. Well im sorry but my brother doesn’t work for a main auto dealer, however I do work for big web design companies, but guess what, I also offer my services as a freelance website designer direct to the public! I can build you a very attractive new company website, or an Ecommerce website (sometimes called Shopping sites) with a clean and simple shopping cart system. I have built loads of them, both for other companies and for individuals. Real estate property websites, photographers sites to sell their photos online, E-learning websites, electronic download website, medical websites, websites for schools the lot. If you already happen to have a website but want to redesign your website, I can do that too, no problem. So come and take a look at my web design portfolio and drop me an email or give me a call, I can save you a fortune. The memories haunt me sometimes, in a good way. I ran a CNet c64 BBS for a few years at the ripe old age of 14. I wound up friends with some other sysop’s in my county. After a while I discovered music,cars and girls and left it all behind. I’d go back to those days of phreaking into party lines in a second. I always smile when I think of those days. –=l8r=–. Wow Murph’s story is nearly identical to mine. I ran a C-Net DS-2 BBS in northern IL in the late 80’s. Bought a 67 Camaro, then came the girls, and there was no more time for the BBS. It makes me sad though. It was awesome going to sleep and having all the disk drive lights start going nuts because someone was on. Just bought a C-128 again, but can’t see much call for a BBS. Stupid internet. Still have the Camaro, can’t get the chicks anymore though. Music of Michael Jackson is going to live for ever no matter what, I think It’s became a classic of ‘pop’, He was so stressfullast time and has lots of problems, poor guy – that was probably end for him – so sad all we can do is keep memory of him in our hearts. Shady greens — including lettuce and spinach — outdo the list of the 10 riskiest foods, according to a study from a nutrition advocacy band released Tuesday. I remember running my own ddial back in the day.